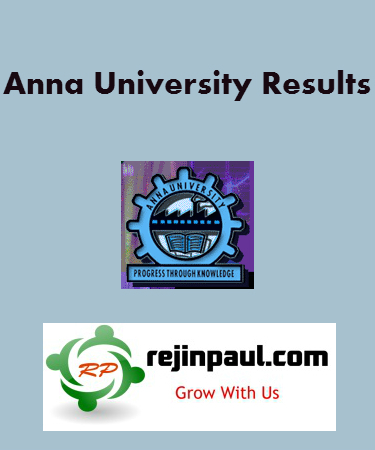 Anna University Revaluation Results Nov Dec 2018 Latest updates from rejinpaul.com - Anna University Revaluation Results 2019 last date to apply, Nov/Dec 2018 revaluation results & many more. Anna University has released the Semester Examination results on 12th Jan 2019 for both UG and PG students. Students have got their results through SMS as well as many students have checked their results through aucoe.annauniv.edu and coe1 Student login. It was announced that Affiliated Colleges will receive the results in PDF on 18th in respective colleges. After the Pongal holidays, University released Notification regarding Anna University Revaluation process. On 18th Jan, It was notified that Last date for applying revaluation will be 25th Jan 2019. Hence We request Students to check with your respective college exam cells, to check the last date to pay fees in college. Rejinpaul.com will provide notification regarding the Anna University Nov Dec 2018 revaluation results in this page. Students can comment their queries in the comment box below and also they can bookmark our page to know the latest information regarding Anna University Revaluation Results 2018 Nov/Dec. Web Portal is opened for applying Photocopy of the answer scripts of Nov/Dec 2018 Examinations. Last date for Candidates 25-01-2019. Web Portal is opened for applying Photocopy of the answer scripts of Nov/Dec 2018 Examinations. Last date for Candidates 26-02-2019. Web Portal is opened for applying Revaluation of the answer scripts of Nov/Dec 2018 Examinations (FIRST YEAR). Last Date for applying Revaluation of Answer Scripts is 09-03-2019. Students who have failed in any subjects or those who feel that they got low grades in any subjects, can apply for revaluation. Hence, Revaluation procedure is to be carried out in two phases. Phases I is to pay Rs 300/- per subject to get the photocopy of the answer sheet and phase II is optional. Hence all students who are willing to apply for revaluation should apply for photocopy first. Once Photocopy is received, they can scrutinize their performance and get acknowledged to apply for phase II revaluation. For Phase II, Students need to pay 400/- per paper. For all students who paid for phase I, University will send the photocopy to respective colleges. Students shall get the opinion from the subject staffs to apply for phase II revaluation. Anna University Revaluation result for Nov Dec 2018 Exams is expected to be declared by 1st week of March 2019. Official date will be announced in our page. Official websites to check Anna University Revaluation results is coe1.annauniv.edu and aucoe.annauniv.edu. Students can also check results.rejinpaul.info and rejinpaul.com to get reliable information regarding Nov Dec 2018 Revaluation results. How to apply for Anna University revaluation results ? can we expect reevaluation results for nov/dec 2018 by this week? WHen the revaluation result published?